The alternative given vide OM dated 12.5.2017 though to some extent it will benefit a good % of old pensioners, it cannot make up the lifelong loss old pensioners will suffer due to denial of option 1. Ever since Honourable Supreme Court land mark judgement dated_____ in UOI vs D S Nakra. In the hide and seek game with UOI for 100% parity between present & past Civil Pensioners Bharat Pensioners Samaj had this time secured Penalty Corner but the Babu in DOP & PW foiled the final hit. The final blow was delivered in the 7th meeting of feasibility committee on 17.10.2016 when as mentioned in Para 4 of the official minutes vide No. 38/37/2016-P&PW(A) GOI Ministry of Personnel, P.G. 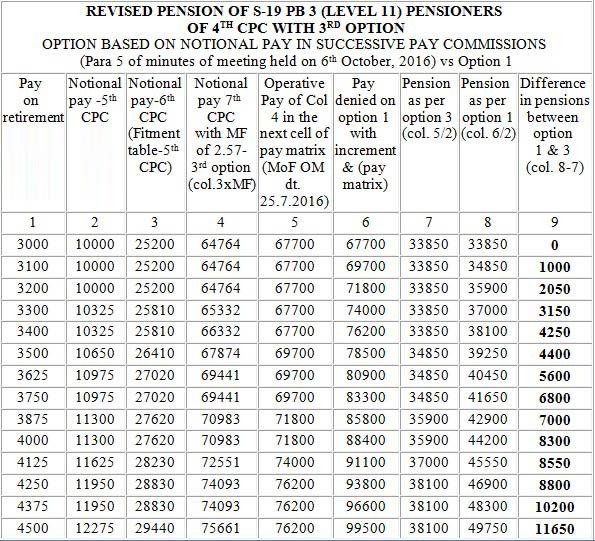 and Pensions -DOP &PW dated the 31st October, 2016 (placed here under). JCM (staff side) agreed with govt's alternative proposal.